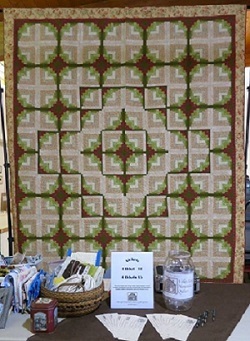 Every two years, guild members create a magnificent raffle quilt to raise funds to support guild programs. In addition to creating the quilt, members sell a minimum of 12 tickets each (or they purchase those chances in hopes of winning it themselves). Members also staff various opportunities to exhibit the quilt and sell tickets. Since virtually all members participate in this venture, the effort is minimal—many hands make light work—and the results are impressive. Many thanks to Connie Stevenson, Barbara Hughes, and Karen Glasthal! This outstanding committee chose the pattern, purchased the fabric, and had many guild members make all the blocks.